Apowersoft Free Screen Capture empowers users the capability to capture the full screen, a spot of screen, an active window and more. Not only does this tool create screenshot instantly for you, it also provides editing options after you have snapped the image. Within these, you can highly customize your screenshot by using texts, shapes, lines, arrows, callouts, blurry effect and highlights along with diverse colors. Upon the creation of a snapshot, you can either save it in several image formats to local drive, or share it to your social networks. Moreover, you can also see the exact dimension, size and others of every image. 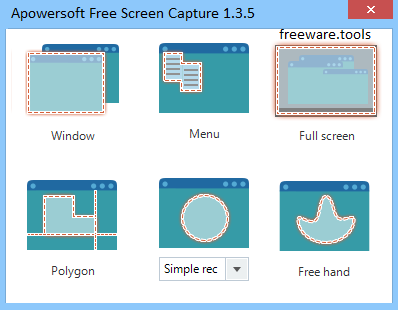 Apowersoft Free Screen Capture is an efficient and very simple to handle piece of software which aims to assist you in grabbing pictures of your computer screen, allowing you to edit them, before saving or sharing the images on social media websites. Moreover, you can schedule task to run on a regular basis, grabbing screenshots for a defined period of time, on specific dates and times. Alternately, you can work with the ‘Screen Recorder’ and capture both video and audio from your desktop, saving it to one of several popular formats (AVI, WMV, MP4, MOV, FLV, VOB, and others).